We were surprised by the despondency shown by some followers at the prospect of India acquiring 21 more Mig-29K fighter jets from Russia.Some people have a misconception that Mig-29K is the poor cousin of more flamboyant Su-30 MKI. Let us put things in perspective. Whereas Su-30 MKI can carry payload of 8000 kg to 5500 kg of Mig-29K, Su-30 MKI also has a handicap in having much larger RCS as compared to Mig-29 K.
Radar cross section is the measure of a target’s ability to reflect radar signals in the direction of the radar receiver, i.e. it is a measure of the ratio of backscatter power per steradian (unit solid angle) in the direction of the radar (from the target) to the power density that is intercepted by the target. As per available figures on internet RCS of air-loaded Mig 29 K is taken to be 5m square while that of Su-30 MKI is taken to be 15m square. With composites and coating of Radar Absorbent Material (RAM), clean (without payload) Mig-29 K may actually give an RCS of as little as 1.11m square only. But remember that it will be carrying a load of 5500 kg, so its RCS is taken to be 5m square. RCS of clean (without payload) F-16 Block 52, since it is coated with RAM and is planform in construction, is 1.2m square. But remember it will be carrying a payload of 7500 kg, so RCS of loaded F-16 Block 52 is also taken to be 5m square. JF-17 Thunder is a small aircraft. TWR ( Thrust to Weight ratio) of JF-17 isn’t very high. Adding RAM would mean increasing the weight. So it has little or no RAM. Also JF-17 is not very planform in construction. Still being small, and the fact that it has DSI, a favourable clean (without payload) RCS i.e. 2.5 m square is taken. But Thunder also carries a payload of 3600 kg. So RCS of air-loaded JF-17 Thunder is taken to be 5 m square. Mig-29K has Phazotron Zhuk-ME radar which has a range of 120 km against RCS of 5 m square. Su-30 MKI has N-011M BARS. It is also pertinent to add that radar manufacturer of Su-30 MKI of late offers a new BARS which has higher power output as compared to earlier version, and hence more range. But whether any Su-30MKI of India is fitted with new BARS, is classified. So we take older BARS. The range of old BARS is 140 km against RCS of 5m square. F-16 Block 52 has APG-68(V)9 radar. According to official specifications, APG-68 (V) 9 onboard F-16 Block 52 and RDY-2 onboard Mirage 2000-5 or Mirage 2000-9 has same range. So it comes out that range of radar of F-16 Block 52 is 105 km against RCS of 5m square. Meanwhile, APG-68(V)9 has bigger antenna than KLJ-7 onboard JF-17 Thunder. Bigger antenna gives more range. Moreover APG-68(V)9 is also manufactured by a pioneer and more established company i.e. Northrop Grumman. This size of antenna cannot be supported on the smaller though petite nose of JF-17 Thunder. 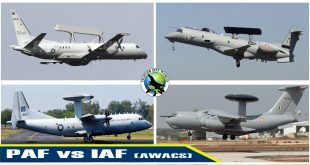 Pakistan Air Force also wanted to replace KLJ-7 with RC-400 radar manufactured by Thales. It is known that range and power of RC-400 is about 20 percent lesser than RDY-2. Janes Defence Weekly published that KLJ-7 has a range of 75 km for RCS of 3m square, which seems closer to the truth. That gives it a range of 85km for RCS of 5m square. 1. Mig-29 K will detect an Su-30 MKI from a range of 158 km, while Su-30 MKI will detect Mig-29 K from 140 km. 2. Mig-29K will detect F-16 Block 52 at 120 km while F-16 Block 52 will detect Mig-29 K at 105 km. 3. Mig-29K will detect JF-17 Thunder at 120 km while JF-17 Thunder will detect Mig-29 K at 85 km. Hence Mig-29 K is the best BVR fighter in the subcontinent. As regards to JF-17 being equipped with AESA radar, we will take up the issue on this forum tomorrow. Please stay tuned. PS : We no way claim that these facts and figures are final or borne off the experience of the author. They are based on data available on various online forums. Tags APG-68(V)9 F-16 Block 52 F-16 Block 52 and JF-17 Hence Mig-29 K is the best BVR fighter in the subcontinent. India indian airforce JF-17 Thunder KLJ-7 Mig 29 K N-011M BARS Pakistan Pakistan Air Force Phazotron Zhuk-ME radar RCS Figure of Mig 29 SU-30 Su-30 MKI The Best beyond visual range ( BVR) fighter jet in India and Pakistan - Mig 29K What is RCS ?